Homogenizer - what is it, and why do I need it? A Homogenizer is a piece of laboratory or industrial equipment used for homogenizing of a variety of samples such as tissue, plant, food, soil, and many others. Cell Lysor, Disperser, High Shear Mixer, Homogenizer, Polytron, Rotor-Stator Homogenizer, Sonicator or Tissue Tearor - What's the difference? Which homogenizer do I need? All the above are physical homogenizers and while people may call them different names, they are all actually talking about the same exact homogenizing product. A PRO Homogenizer is a high shear mixing, rotor-stator homogenizer that can be used for dispersing or tissue tearing or cell lysing...so we just call it a homogenizer for short! Not sure if a physical homogenizer is right for you? Check out our "Field of Homogenizing" page or request a demo of one of our physical homogenizers. But what exactly is the homogenizer? Is it the motor or the stainless steel probe? The motor unit is actually technically considered the "homogenizer". PRO has a comprehensive collection of both handheld or stand mounted configurations for homogenizing with high speeds of up to 35,000 rpm. However, the precision in homogenizing lies in the probe. This is the stainless steel component that actually goes into your sample. With the high-quality design of our PRO Quick Connect Generator Probes and Multi-Gen 7XL probes, you can homogenize all samples from the softest to the toughest both quickly and efficiently without compromising the sample. Physical homogenizing sounds like it would really affect my samples, I'm concerned? Maybe I should just use a mortar and pestle? High shear laboratory homogenizers are designed to homogenize samples quickly. This faster homogenization times mean less chance of heat degradation to the sample. Most homogenization takes place in a matter of seconds. Mortar and pestle homogenization takes substantially longer and if often affected by inconsistent user processing. While mortar and pestles may be a viable option for disrupting cells, unlike a PRO homogenizer, it is not very efficient at homogenizing solid tissue. Absolutely! A PRO Scientific rotor-stator homogenizer can be an effective means of homogenizing soft tissues. 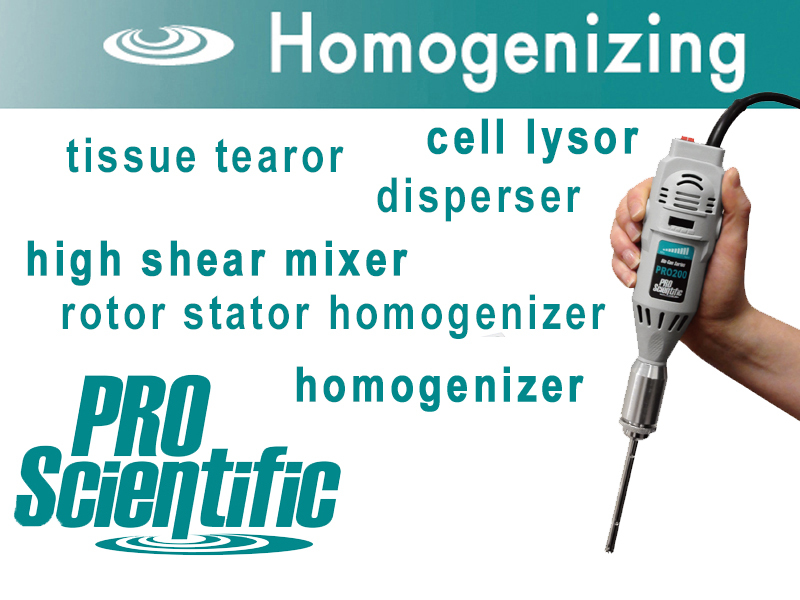 When using a rotor-stator homogenizer, like PRO Scientific’s homogenizer, it is important to select a generator probe that provides a low sheer number. A PRO Scientific sales associate can assist you in determining shear numbers of the generator probes that would work best for you. With that generator probe selected, most homogenization will take place in a matter of seconds, so heat production is not a concern. We have a variety of homogenizer package kits that are ideal. Not sure which homogenizer will work best for your application? Review our extensive homogenizer application database. Or contact us so we can assist you in finding the best homogenizer for your research.